JumpOut! 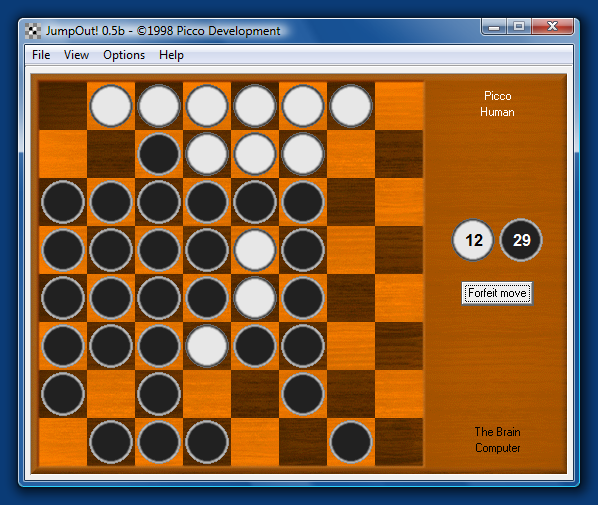 is my version of the classic board game typically known as Reversi or Othello. The game has colorful graphics with multiple themes, pleasant music by Bjørn Lynne, and nice sound effects. You can play against a friend, against the computer, or watch the computer play against itself. 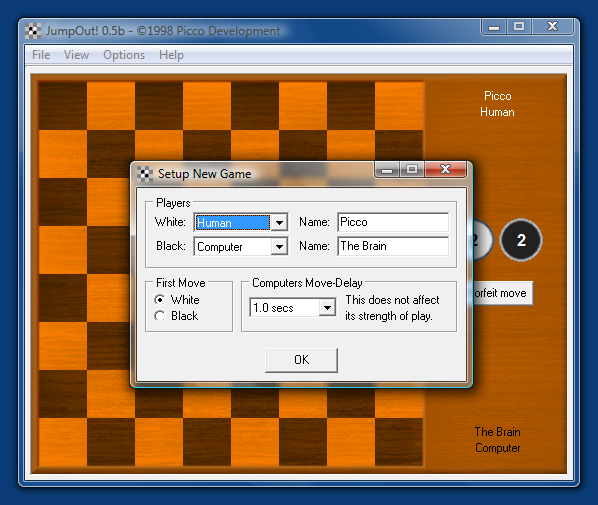 The game is played on a board with 8 x 8 squares. In the starting position the 4 center squares are occupied by two pieces from each player, diagonally opposite each other. The squares marked with X'es show all of White's valid moves. The black pieces that are between the piece that White places and White's other pieces in the 8 directions will become white. Here White can take 3 of Black's pieces by putting a piece on the white marker. Afterwards, Black can take 3 of White's pieces and at the same time get a piece on the edge, which is harder to lose. The corners are the best squares to get, because they can't be lost. Here Black has no legal moves and has to forfeit. You can't forfeit if you have a legal move. 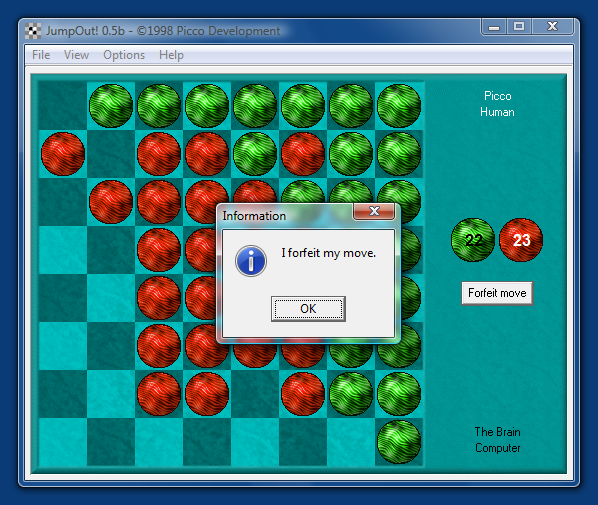 The game is over when there are no more empty squares or when neither player can move. 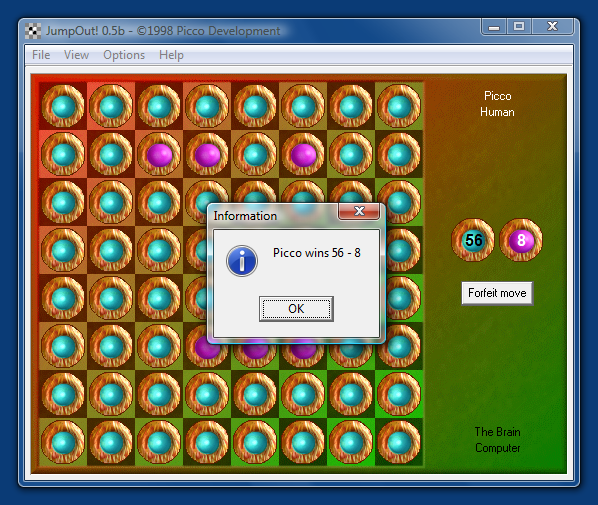 The player with the most pieces wins. Two players can play against each other. One player can play against the computer. The computer can play against itself. Three different backgrounds and one low-color background. Three different sets of pieces and one low-color set. Music by well-known computer musician Bjørn Lynne. This opens the Setup New Game dialog. Here you can select who plays White and who plays Black. You can also select if White or Black moves first. If you're already playing a game you'll be asked to confirm whether you want to start a new one. This will exit the program (with no warning if you were playing a game). Here you can switch between the included backgrounds, Default, Marble, Colorful, and Lowcolor. The menu item "Other..." allows you to select a picture of your own. Here you can switch between the included pieces, Default, BubbleBlocks, ZebraSphere, and Lowcolor. This enables or disables the sound effects. This enables or disables the music. Here you can switch between the included tunes, Funky Guppy, High Spirits, Stranger on a Hill, and X-Mas Zpireet. The menu item "Other..." allows you to select a MIDI file of your own. This open a dialog with credits. Changed: Thanks to Munkering I now know that the game can run in Windows 3.x. However, the long filenames are a problem, so I've renamed all the files according to the old 8.3 standard. Changed: The text on the forfeit button has been changed to "Forfeit move" for clarification. Changed: The boards now consist of one file each instead of two. This will make it easier to add custom boards. Added: All settings are now saved in a file called JumpOut.ini. Added: Lowcolor board and pieces. If your graphics card can't show more than 256 colors, these are for you. Fixed: A little bug that sometimes caused the music to continue playing when ending the game in Windows 3.x. Bjørn Lynne for letting me use some of his excellent MIDI files. Without them you would probably be listening to some off-beat, out-of-tune crap, made by myself. Daniel M. Paul for having designed the pieces BubbleBlock and ZebraSpheres, and for naming the game. The project name was Othello which is not very original.